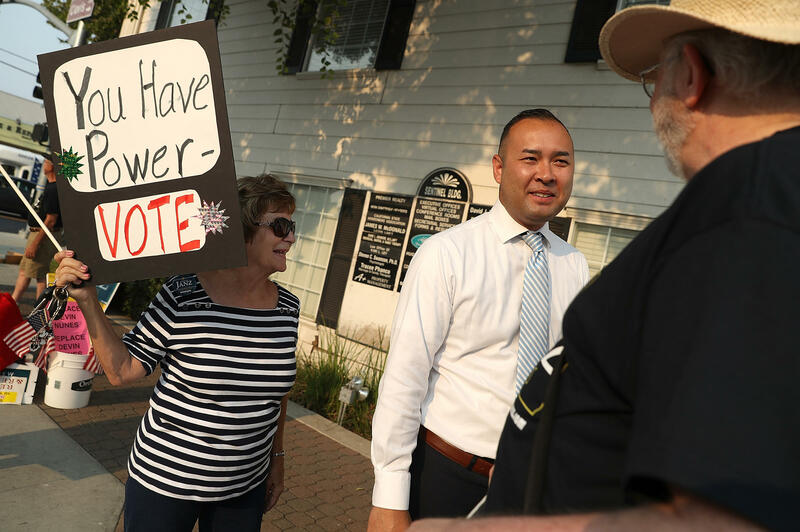 Democratic U.S. House candidate Andrew Janz raised more than $4 million in three months as part of his effort to unseat U.S. Rep. Devin Nunes, R-Calif.), part of a wave of record-breaking fundraising hauls by Democratic candidates. The money is flowing to unlikely districts and is frequently tied to Democrats' opposition to President Trump. In Fresno, Calif., prosecutor Andrew Janz, a Democrat, raised an eye-popping $4.1 million in the third quarter. He's out to topple an eight-term Republican, Rep. Devin Nunes, chair of the House Intelligence Committee and a staunch ally of President Trump. Janz said his donor base is widespread. "In many parts of the country and in many parts of our state here, and even locally, people wanted this guy out of office," he said. Other Democratic challengers have announced similarly stunning dollar amounts for the third quarter, which ran from July 1 to Sept. 30. Sharice Davids, in an eastern Kansas district, raised $2.7 million. Amy McGrath, in central Kentucky, raised $3.65 million. Elissa Slotkin, in southern Michigan, raised $2.6 million. Spending numbers compiled by the Congressional Leadership Fund, a GOP super PAC aligned with House Republicans, and obtained by NPR, offer Republicans some good news and some bad news. The good: The Congressional Leadership Fund has spent $90 million on the general-election campaign, versus $51 million by its Democratic rival, the House Majority PAC. The bad news: The Democratic Congressional Campaign Committee, or DCCC, has outspent the NRCC $64 million to $47 million. And more bad news: Democratic House candidates, thanks to the outpouring of small-donor contributions, have outspent Republican candidates, $109 million to $60 million. "The Republican super PACs may not be able to just write a single check to buy a single race because of the massive grassroots fundraising energy behind Democrats this year," said former DCCC chair Steve Israel. But fundraising success doesn't guarantee Democrats an easy glide path to victory. Most of them are challenging incumbents, who, by definition, have won at least once on the same terrain. Andrew Janz's opponent, Devin Nunes, was reelected two years ago with a 35-point margin. A poll last week showed Nunes leading Janz by 8 points. Janz initially focused on building a robust fundraising operation, he said, because "we knew that the national party and the DCCC weren't going to be supporting us." Both parties, but especially the Republicans, are starting the triage process of reallocating super PAC and party funds from candidates who have failed to gain momentum. "The campaign committees are going to have to decide which races they're going to fund, and which races they're going to pull out of," said Tom Davis, a former Republican congressman who worked two election cycles as chairman of the National Republican Congressional Committee, or NRCC. For some House Republicans, the race may be virtually over. Reps. Rod Blum of Iowa, Mike Coffman of Colorado and Mike Bishop of Michigan are among those who have lost support as the NRCC and CLF cancel ad buys and shift dollars to other contests with better prospects. Davis suggested the script for the NRCC chair as he delivers bad news to a colleague in the House Republican Conference: "We thought we'd be able to do a million dollars in TV, but now we have to put that somewhere else because frankly, you're just not performing and we can't afford to waste it to make you feel good."